Globe Telecom blocked a total of 30.8 million of spam and scam text messages in less than a year as the mobile operator intensifies its campaign to rid its network of such annoying and unwanted messages and protect its customers. The leading telecommunication provider expanded coverage of an automated filtering functionality that keeps its customers from receiving scam and spam messages. With the expansion, majority of the company's 2.3 million postpaid customers are now covered by the filtering mechanism, said Joel Agustin, Globe Senior Vice President for Service Management Division, Network Technical Group. Such filtering mechanism, which prevents the transmittal of scam messages to mobile devices, has substantially reduced the number of text scams/scams going through the Globe network, Agustin explained. Globe operationalized the automated filtering mechanism in October 2014 as part of the telecommunication provider's efforts to rid its network of both spam and scam messages. The volume of messages blocked by the network filtering system averages about 90,000/day, reaching a peak of around 200,000 in July this year. The filtering mechanism can be reconfigured to address the kind of spam and scam messages that goes through the Globe network, Agustin said. 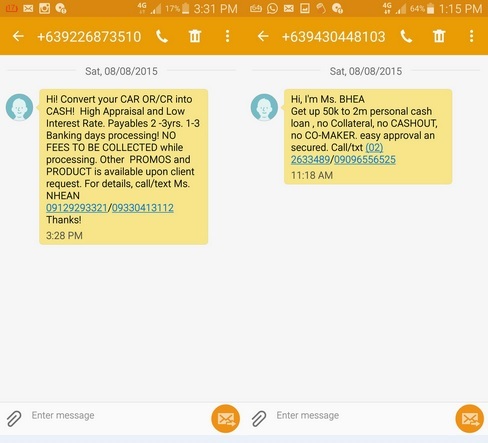 Recently, bulk of spam and scam messages delivered to Globe customers originate from sim cards of competition (with prefixes 0922, 0943), he noted. "We will never tolerate the use of the Globe network by some unscrupulous individuals who want to take advantage of our customers for their own personal gain. Globe has been long committed in eliminating text scam spam as part of our commitment to provide wonderful customer experience," Agustin stressed. He added that the company is continually developing mechanisms that will purge its network of text spams/scams. According to him, mobile numbers that are identified to be a constant source of spam and scam messages will be temporarily disconnected from service. Aside from the filtering mechanism, Globe implemented an awareness drive to educate its customers and keep them from falling victims to text spam/text scams through its #stopspam campaign. In addition, Globe made it easier for its customers to immediately report text scams or text spams that they get on their mobile devices thru www.globe.com.ph/stopspam. Customers just need to provide all the details required and numbers that are reported as source of text scams will be immediately blocked from the network. Mobile customers of Globe Telecom reached 48.4 million at the end of the first half, a 13% rise from 42.7 million a year earlier.